Travis Roste, age 49, of Hutchinson, Minnesota, passed away Thursday, February 7, 2019, at Hutchinson Health in Hutchinson. Mass of Christian Burial will be Wednesday, February 13, 2019, 1:00 P.M. at St. Anastasia Catholic Church in Hutchinson. 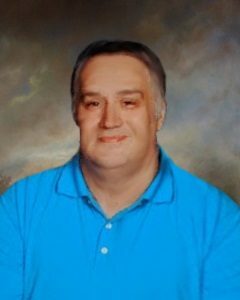 Travis Lee Roste, age 49, died unexpectedly on February 7, 2019, in Hutchinson, MN. Travis was born on October 25, 1969, in Browerville, MN, to parents Myron and Shirley (Barthel) Roste. He graduated from Eagle Bend High School in 1988 and later from Staples Technical College with an Associate of Applied Science degree in Robotics Automated Systems Technology in June of 1990. After graduation Travis took a position with Continental Collision Repair Systems in Lomita, California where he was responsible for measuring vehicles and producing data repair sheets for the company. In 1992 he moved to Red Wing, Minnesota to work at the RAM Center (a robotic-aided manufacturing center). In 2001 he accepted a position as Assistant Purchasing Agent at Interlaken Technology Corporation in Chaska, MN. Travis met his wife Grace (Nora) Del Plana and was married in the Philippines on December 7, 2003. They took residence in Hutchinson, MN. He was a great family man and a loving father to their two daughters, Stacy (13), Katie (11) and son, Drake (7). In his spare time he began his own company, WBC Authentication, which he started to assist boxing collectors with the authentication of autographs in their collections. He wrote articles which were published in several autograph magazines over the years and become a well-respected authority in the autograph industry. Travis had a passion for the boxing arena and spent a lot of his time researching and studying the history of the sport as well as the autographs of all the famous boxers. Travis was proud of his contribution of an original “Fight Program” of the 1938 World Championship fight between Eagle Bend’s very own Harry Thomas and Joe Louis, which he donated to the Eagle Bend Museum. He enjoyed his hobbies of collecting sports memorabilia, walks with his wife Grace and family time with his children. His family and friends will always remember him as a quiet but caring person. His business associates and clients refer to him as a true gentlemen and honest business man. Travis is survived by his wife Grace (Nora Del Plana) his three children Stacy, Katie and Drake of Hutchinson, his mother Shirley (Barthel) Roste, father Mike Roste of Long Prairie, MN and his siblings Jodi Roste of Moorhead, MN, Jay and his wife Lisa (Skogen) Roste of Barnesville, MN, brother Jeff and his wife Lucy (Golnitz) Roste of Alexandria, MN, twin brother Trevor Roste of Alexandria, MN, brother Chad and his wife Julie (Thielen) Roste of Sauk Rapids, MN, and his sister Jill (Roste) and her husband Jonathan Miller of Appleton, MN; nephews Jaran Roste, Joey Roste, Michael Roste, Conrad Roste, Nicholas Roste, and Andy Miller; nieces Jennifer Parsons, Jazmin Roste, Jana Roste and Jacy Roste. He is preceded in death by his Grandparents, Olaf and Huldena of Burtrum, MN, and Grandparents Rudy and Cecelia (Pouliot) Barthel of Elk River, MN. I was very sorry to hear this yesterday. Travis was always a very pleasant person to talk to. He was always where his kids were supporting them at St. As and the entire community. I saw Travis from the time he was young until now. He was an asset to the world!